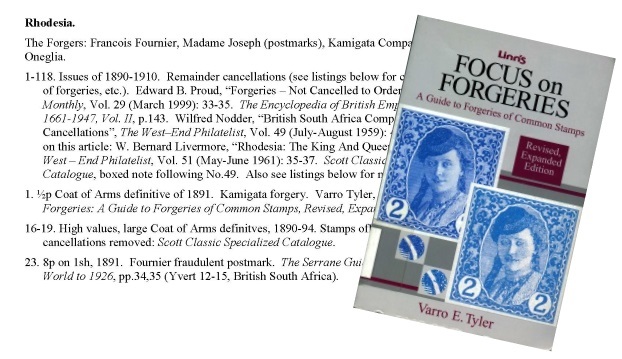 This month’s featured resource has a lengthy title: Index of literature in the English language that describes postal stamp forgeries, fakes, reprints, fraudulent postal markings and other obliterations, and, Bibliography. In the library, we refer to it familiarly as the “Tedesco Index” for its creator, Theodore “Ted” Tedesco. The first installment of the “Tedesco Index” appeared in the 1st quarter 2015 Philatelic Literature Review. The cover to that issue featured the Rev. Robert Briscoe Earée, author of Album Weeds: How to Detect Forged Stamps. 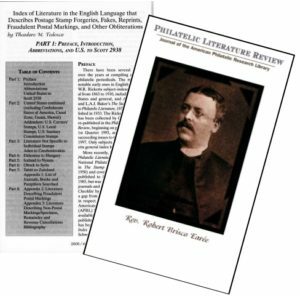 The index was originally published serially in our quarterly journal, the Philatelic Literature Review, from 2005 to 2009. Ted gave us a complete digital copy, which we printed and put in 3-ring binders for reference in the library. 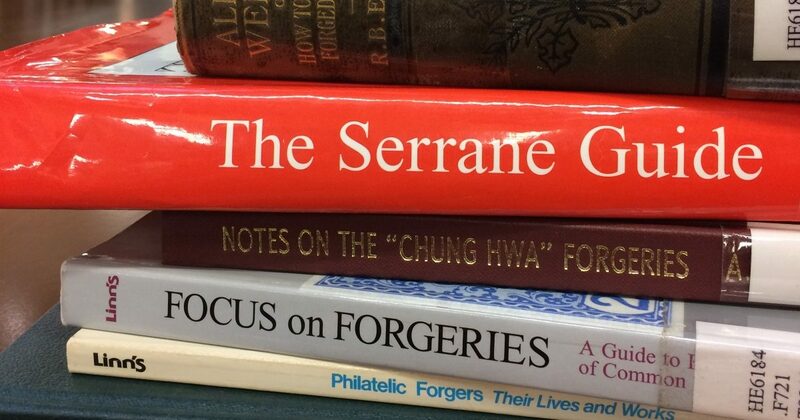 Because it covers the entire world, organized by country, and gives references not only to standard resources like The Serrane Guide and Album Weeds, but also to the many un-indexed journals in our collection and online resources, it is one of our go-to resources for forgery questions. In 2014, Ted spent a couple weeks at the library updating the index in order to prepare a revised edition. His only condition was that the APRL make it available online for researchers—a condition we were more than happy to comply with. I worked with Ted to format his manuscript for online use, and it is now available from our website (or search our online catalog for “index & tedesco”). A sample section of the “Tedesco Index” for Rhodesia. One of the entries references Varro Tyler’s Focus on Forgeries. The index is a large PDF file, but it’s worth waiting a few minutes to download. The researcher will be rewarded with a wealth of forgery references, organized by country and accessible via a clickable table of contents. The entire document is also keyword-searchable (use your Adobe Reader’s search function). If you are unable to access the file, you can always contact us for assistance. Most of the resources cited in the index are available in the APRL collection, which is where Ted did most of his research. The books can be borrowed by mail, or (because most cover the world and most researchers are interested in specific stamps) we can make scans or photocopies of small sections. See our Library Services page for details and fees.